15 Clerkenwell Close, London, by Amin Taha and Groupwork. Photography is by Tim Soar. Planning documents at the centre of a dispute between architect Amin Taha and Islington Council, over the future of the controversial 15 Clerkenwell Close in London, have come to light after previously being thought to be lost. 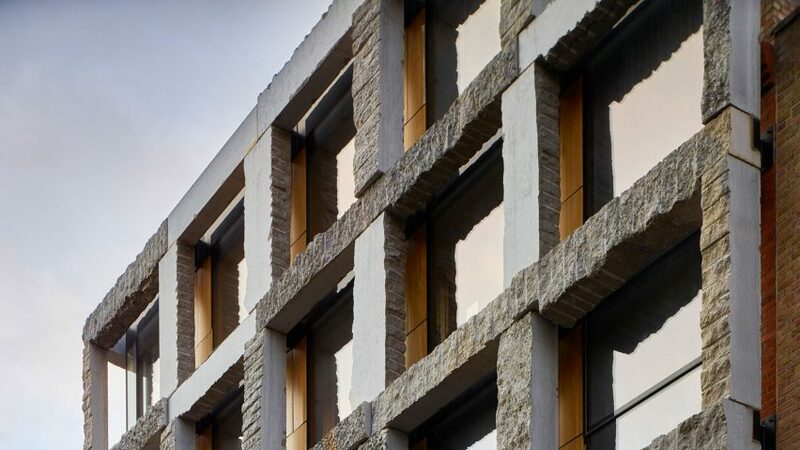 The documents, which are now available to view on the council's online planning portal, show details of the fossils that appear on the facade of the Dezeen Award-shortlisted and RIBA Award-winning housing block. Taha had previously believed the documents to be lost, as the council claimed the placement of the fossils had not been detailed in the planning application. It cited them as a key issue in a demolition order it issued against the project in February 2018. The architect believes they offer evidence that the demolition order has no grounding. Taha said he was previously told by the council that the documents showing the stone samples his studio submitted were not in its records. "I am extremely reluctant to keep talking about it, but we were told by the enforcement team that despite our record of drawings, photos, emails and letters, there was no evidence at the planning department of stone samples having been submitted," Taha told Dezeen. "We assumed that they had been lost, or perhaps never shown by the case officer to his team. It turns out that the physical samples had been photographed and presented by planners as part of their approval of the design and its materials, but not uploaded onto its planning portal." Taha was made aware of the existence of the documents in the council's records after a friend visited the planning office and requested to see the hard copies of the submitted applications. "A member of the planning team presented the file with drawings of the stone design and photos of the stone with fossils and also stated that these plus other reports had now been uploaded to the planning portal that morning," said Taha. "That's almost four years after they were submitted and approved. We were given the news by the architect that the evidence existed after all." This is the second time an enforcement notice has been issued for the six-storey building. An initial order was issued in 2017, but dropped when planning documents detailing the building's stone structure were found. After finding out that the documents showing the fossils have been uploaded to the planning portal, Taha contacted Islington Council to enquire if the second enforcement action would also be dropped. "The second notice, issued nine months after the first, says there was no evidence that the stone design would appear so rough, ugly and detrimental to the conservation area and listed buildings instead of fitting in. Now they have both the drawings and photos of these how does that argument stand?" said Taha. "I therefore contacted the enforcement team to ask if they were dropping the enforcement action?," he continued. "Their response was that they would not as it made no difference to them and as I had appealed their notice it would be left to the appeals process now." Islington Council restated to Dezeen that the built building does not align with the planning documents, and that it will continue with the enforcement action. "In the council's view, the existing building does not benefit from planning permission, and the council issued an enforcement notice on 26 February 2018, to take effect on 9 April 2018," said a Islington Council spokesperson. "The owners of the site appealed that enforcement notice on 6 April 2018, and the case is now due to be considered by the Planning Inspectorate." A decision is expected to be made in March 2019.